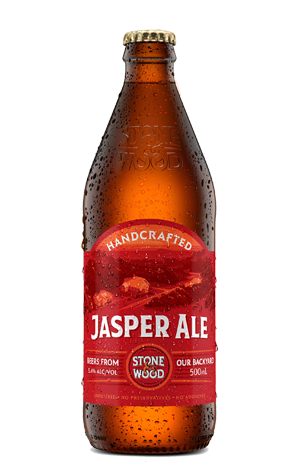 Jasper is the red ale that's been part of the Stone & Wood lineup for years. Yet we'd wager there are plenty of fans of the brewery who have little idea the beer exists. While Pacific Ale has led the way and many seasonals, not least the annual Stone Beer, have made waves, Jasper has tended to be the brewery's equivalent of Marlon in the Jackson 5. But Jasper, which took out Best British Style Ale at the 2017 Australian International Beer Awards, has been refurbished – inside and out. Starting with the outside, the beer has been made part of the brewery's Beers From Our Backyard range, joining the likes of Cloud Catcher in 500ml bottles. And, on the inside, it's moved from Old World to New. Atop the specialty malts they're now layering Galaxy, Enigma and Mosaic hops, causing tropical aromas to leap from the glass. The nutty, caramel malt flavours are still there as the beer warms but remain secondary to the hops on the palate, while the beer seems leaner thanks to the higher hopping rate and tight bitterness too. A reinvention very much in tune with the contemporary beer scene.